DETROIT — Edwin Jackson figures he’ll enjoy pitching for as long as teams are willing to put him on the mound. Jackson tied a record Monday when he played for his 13th major league club, allowing a run in six innings for the Oakland Athletics in their 5-4 victory over the Detroit Tigers. Called up from Triple-A for his first big league appearance of 2018, Jackson matched the mark for most teams set by former reliever Octavio Dotel. Jed Lowrie hit a tiebreaking solo homer in the top of the ninth. 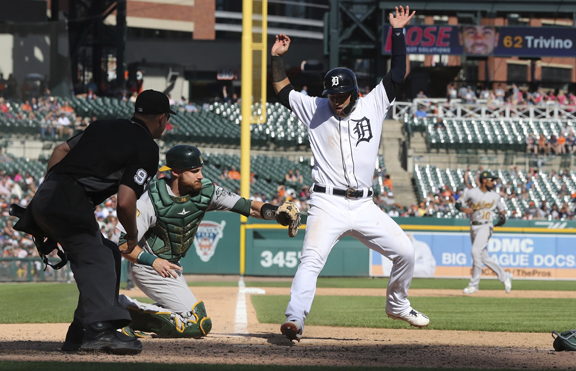 The A’s trailed 4-1 after Detroit’s Nicholas Castellanos hit a three-run homer in the seventh, but Oakland scored three in the eighth off Joe Jimenez to tie it. Then Lowrie connected for his 12th home run of the year, barely fair down the line in right field off a cutter from Shane Greene (2-4). Lou Trivino (6-1) got the win in relief, and Blake Treinen pitched the ninth for his 18th save in 20 chances. The A’s have won seven of nine. Jordan Zimmermann pitched five scoreless innings for the Tigers, but that wasn’t enough to prevent Detroit’s sixth straight loss. Stephen Piscotty and Jonathan Lucroy had three hits apiece for Oakland. Piscotty hit a solo homer in the seventh to tie it at 1. The A’s have homered in a record 26 consecutive road games. The 34-year-old Jackson allowed six hits and struck out seven with no walks. It was his first start since Sept. 28, when he was with Washington. Down by three in the eighth, Oakland chipped away against Jimenez. Marcus Semien hit a sacrifice fly, and Lucroy followed with an RBI single. Then Franklin Barreto tied it with a run-scoring double. John Hicks hit an RBI single for Detroit in the fourth to open the scoring. Oakland center fielder Dustin Fowler made a diving catch with a runner on second to end the seventh.